Manufacturer & Exporter of Beading Embroidery Work & Hand Embroidery Badge. Our product range also comprises of Lehenga & Gown Embroidery Work, Embroidered T-Shirt and Swarovski Embroidery. Cutdana Beads Zari Embroidery Work. These Swatch embroidery have been made using of finest quality and costly materials of White colors and have intricate Cutdana beads embroidery's made up. It will be size is 12 by 12 inch. 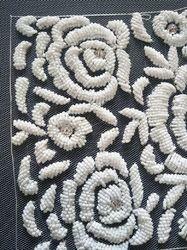 We can also negotiative to this Cutdana Beads embroidery. Embroidered Zari Hand Work offered can be made available by us in different exclusive finish designs that provide for enchanting finished looks as desired and demanded by the customers. Further, the exclusive embroidered patterns as well as beads work also help in adding to it a vibrant finished look. Some of its features include mesmerizing construction finish, designed as per latest fashion trends, use of quality fabric for flawless smooth finish, beautiful stylish looks, adds to the fashionable appearance of apparels.